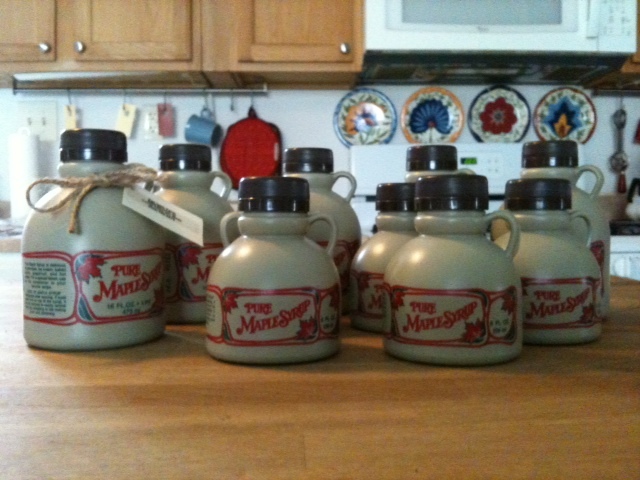 The maple syrup jugs are tagged and stored on the shelf, waiting to be purchased. So if anyone out there is interested let us know. We only have pint sized jugs left, going for $9.00 a pint plus shipping. This pure maple syrup comes from our local maple trees and has had nothing added to it. Its amber brown sweetness is delicious slathered over pancakes or waffles, or added to any recipe you can come up with. I like to drizzle a little over fresh cooked carrots. Mmmm. Whether you are a maple syrup lover or have never experienced its flavor before, try some Pot Hole Farm maple syrup. Its DELICIOUS! If you are interested you can leave a comment on the blog or contact us at hgjobe@gmail.com. It was already dark last night when Sonny went out to close up the chicken coop. After about ten minutes he came back into the house and informed me that we only had eighteen chickens sitting up on the roosts. One was missing. The three guineas were back under the eves of the pole barn. “I counted heads more than once and still only came up with eighteen,” he said. We always make sure our chickens are accounted for every night. Once in a while we will get one that decides its better to stay out all night, and in the morning we find her waltzing around the yard. We searched all the usual places they like to hide, and checked to make sure she didn’t get locked in the garage (thats happened before). All we could do was hope that she would turn up in the morning. Unfortunately that was not the case. There was no sign of her. Not even a feather. The odd thing about it all is that this afternoon when we came back from town we went to the pole barn to check things out. There laying on the dirt floor was a chicken skeleton. It had been picked clean and only two tuffs of feathers were laying beside her. I’m not entirely sure but I don’t think her cannibal sisters would eat the feathers too. That hen was not in the pole barn this morning. So where did she come from? There weren’t enough feathers for it too have been the murder site. Her head and feet were still attached, but she was missing everything else. I guess the cats could have dragged the body into the barn, but that is unlikely. They don’t really spend anytime down there. They would have just carried it further out into the field. The dog has been in the house all day. I guess its possible she was killed close to the barn and the chickens had a game of chase with the carcass, but that still does not explain the absence of feathers. Any ideas? Maybe Miss Scarlet killed her in the library, plucked her and then was interrupted before she could put her in the roasting pan. Or maybe it was Mrs. White who clubbed her over the head with a lead pipe. Or Professor Plum. He always has been a bit shifty. Any clues to what might have happened to our dear Henny Penny? The catch cage was empty this morning and the marshmallows were still in place. I guess that could rule out Mr. Raccoon….or maybe he was too full from a chicken dinner. I stood by the window this morning and watched as five guineas made their way around the front of the porch and passed by the bird feeder. There should have been ten. It was a solemn march, their usual high pitched squeaks were hushed. Something was wrong. My investigation took me outside. No sign of the other five. No loud honks between groups of bug grazing guineas in the meadow. I followed a trail of guinea feathers down the driveway, across the road and up into the creek bed. My heart sunk knowing that at least one of my prized guineas was gone. I made my way back to the pole barn where they all like to roost at night. This had to be the sight of the murder, or was it a massacre. There was no sign of animal prints, no claw marks on the support beams of the barn. The chickens like to lay eggs in an old dog food bin filled with straw. There smeared across the side was a red streak of blood. A small guinea head laid there beside it, its half closed eyes beseeching me to avenge its death. It is a mournful time here at PHF. An event such as this is traumatic to say the least. One day my guineas are happily squawking, eating bugs in the tall grasses of the pastures and the next minute we are marauded by a wild animal. I suspect it is a raccoon or a family of raccoons. Either way we have to do something to stop it. We are not a drive through restaurant. All chickens have been accounted for and I am still hoping that there may be another small group of guineas hiding out in the woods somewhere. This is war Mr. or Ms. Raccoon. Don’t mess with me and mine. Yes! A new fleet of guineas has arrived at PHF. Thats right I said a fleet instead of a flock, because they move around in groups like battleships. Their purple gray bodies float across the tall grass pastures as if there were no feet attached. We picked up eight guineas yesterday from TwoLynn’s Farm. Three females and five males. When we arrived home we kept them inside the dog box and placed it into the fenced chicken pen with the door open. We thought they might need a day or two to get used to their new surroundings. They coward inside the dog box, squeaking softly to one another, until our two existing males rushed up to the fence. All eight guineas ran out of the dog box in a group, feathers ruffled, and trilling in high pitched squeaks and honks. Our two males were excited beyond belief to see others of their own kind and some pretty females to boot. We decided that since we already had two guineas to show the new ones the ropes we would just let everybody out. Sonny swung the fence gate open and our two boys ran inside. There was jumping and squawking and greetings like the hugs and kisses given between long unseen family members. Our boys led the group out into the open where they immediately ran up the hillside. Some of the males jumped in the air, wings spread and bumped chests in an attempt to gain dominance over the other. There will always be small squabbles, but I think our two boys are happy to be part of a guinea family again even though the chickens had adopted them. Today the group roams around the farm pecking at bugs, (I hope eliminating ticks) and enjoying the amenities that PHF affords. I attempted to get a few pics of the birds, but they were too fast for me. Every time I would get close to them the guard on duty would spy me. Sounding the alarm the fleet would quickly go to general quarters,and would kick up to full steam ahead disappearing in a sea of tall grass. I didn’t think I would be this happy to have more guineas, because they constantly make the nerve grating sound of off key wind and brass instruments, but I find I have missed them. Now if we only keep our females from being eaten by predators. When you mention the word “party” to most people, they envision a group of people interacting with another, eating finger foods from a poo poo platter and holding an alcoholic beverage in their hand. Here at PHF the word “party” can hold a whole different meaning and usually includes such props as gloves, shovels and hoes. I think they call them working parties. Saturday was a potato planting party. While Duke took his morning nap, Sonny, Clarissa and I carted a half bushel basket of seed potatoes, the tiller, and an array of hoes out to the garden. We planted about seven and a half rows of potatoes and believe me it was a lot less difficult and much quicker than when I planted five rows by myself last year. I think I like the idea of planting parties. After we finished planting our rows we loaded the tiller, the hoes, and a large bag of seed potatoes onto the back of our old red farm truck. Then the four of us stuffed ourselves into the front seat. I couldn’t help thinking that we must have resembled one of Norman Rockwell’s paintings, with our straw hats perched on our heads, work gloves on the dash and a dust cloud billowing out behind us as our old truck rumbled down the gravel road. Well a Norman Rockwell painting may be stretching it a bit, maybe more like the Beverly Hillbillies before they moved to Beverly Hills. 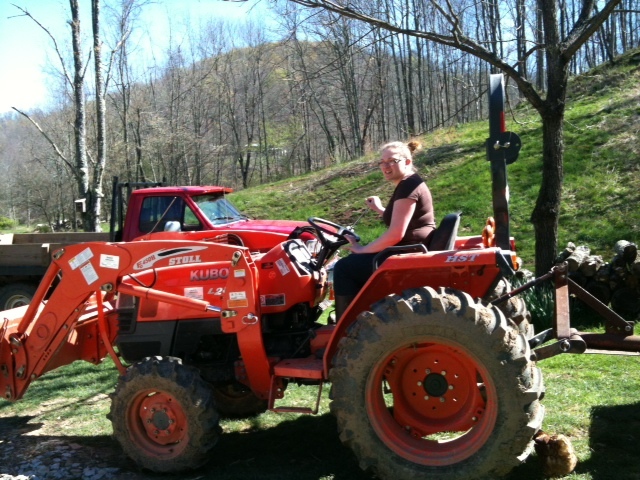 We thought we would be neighborly and help Bill and Paula Guinazzo of Creekside Cabin Farm to start their garden. Having recently moved here they are still settling in and haven’t had much time to do it. So we got their onions and potatoes put to bed and hopefully they will have a good crop. We took another big step on Sunday and bought a hive of bees. Once again our farm truck was called into service. We bought a hive of bees from a family that may have to move out of the area in the near future. The man selling us the bees (Chris) was decked out in his bee suit. Sonny had on a pith helmet with netting all round and used duct tape to close off his pant legs and sleeves. It could be painful if a few angry bees were to fly up them. Bees are not too happy when you move their house. Sonny and Chris strapped the bee box down in the bed of the truck and we transported them forty miles back to our house. 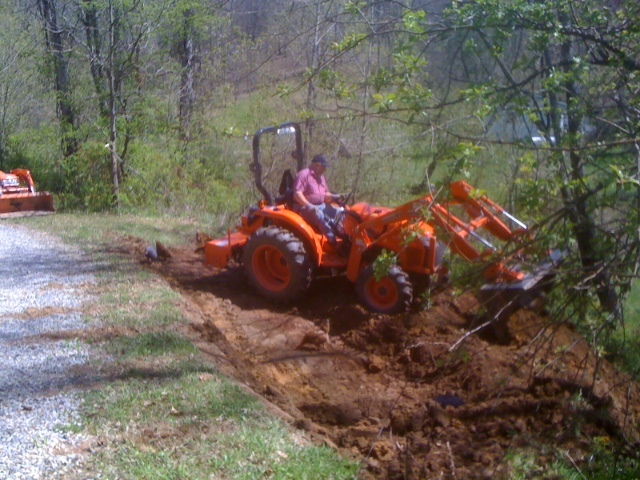 Chris was nice enough to come back with us and help Sonny set the bee box in place under our ancient apple trees. I never saw Sonny as a bee keeper, but then again who would have thought I could talk an old crusty Navy Warrant Officer into being a farmer? Getting ready to move the bee hive. 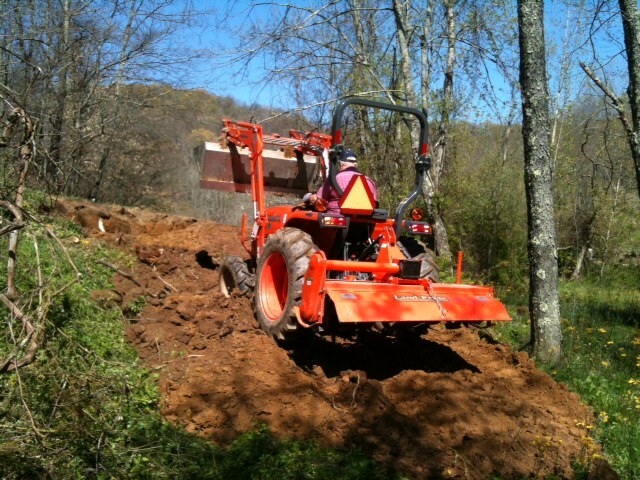 You are currently browsing the Off-Grid in West Virginia blog archives for April, 2012.